On an otherwise lazy afternoon during the Benvenuto Brunello, I had the opportunity to again visit Biondi Santi and must admit that I was rather bluffed by the regal treatment we were given. I had been here before and done little more than see the old cellars, where I was told a story that the staff had certainly recited a thousand times before. 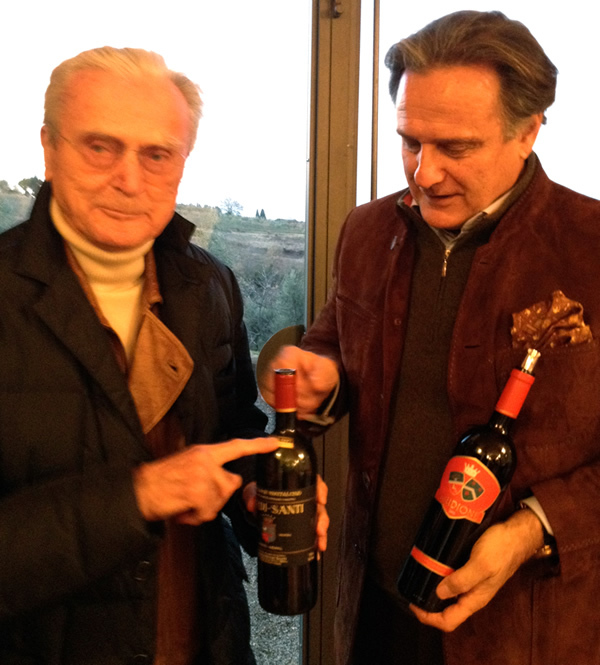 Although a drizzle prevented us from seeing much of the vineyards, Franco and Jacopo took the time to show us not only four wines from Montalcino, but also the range from Castello di Montepò in Scansano, the estate that the latter created when he fell out with his father in 1991. Apparently relations between the two have eased, but there is still a wide rift between them. Like many of his brethren, Jacopo were bitten by the desire to establish vineyards on the Tuscan coast in order to create something of his own. Although the 2001 Schidione is extremely well-made, I can not bring that much excitement to most Cabernet and Merlot from Italy…and the 2006 Morione, a pure Merlot, costs as much or more than the family's finest Brunello di Montalcino.